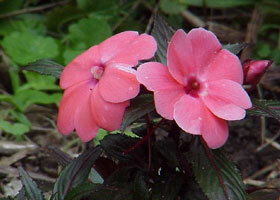 New Guinea impatiens (Impatiens x hawkeri) are still considered new comers to the world of bedding plants. Most are grown in hanging baskets or patio containers. Gardeners who have tried New Guineas in the past may have been disappointed in their garden performance. Uninformed retailers sold them as impatiens for full sun. In Iowa, full sun is not a good location for best growth. New Guineas grow best where they will receive morning sun and afternoon shade. An eastern exposure is ideal. Gardeners who can water the plants frequently may want to try them in full sun. However, neglected, unwatered plants quickly wilt and may die. New improved varieties of New Guinea impatiens have been developed through major breeding programs. Several series on the market today provide gardeners with a wide variety of flower and foliage colors. Although most cultivars are propagated through tip-cuttings, improved seed propagated varieties are on the horizon. 'Tango' and 'Sweet Sue', both orange flowered, are older varieties grown from seed. One of the newest seed propagated New Guinea impatiens is the Spectra series. Plants come in a mixture of flower and foliage colors. 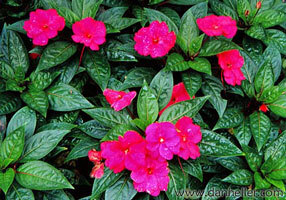 Options abound when it comes to purchasing New Guinea impatiens. Some gardeners purchase plants based on flower color, others are attracted to the brightly colored foliage. 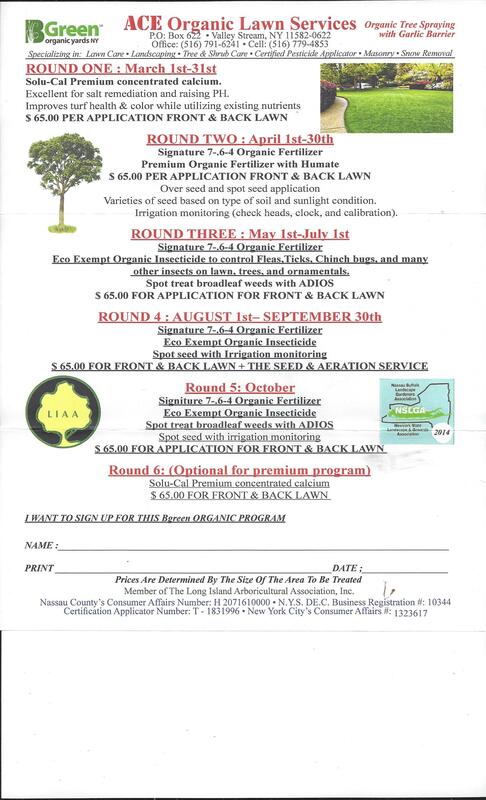 The Ball Seed Company in West Chicago, Illinois has conducted field trials of several New Guinea impatiens series over the past 5 years. Plant characteristics evaluated were vigor, flower color, and foliage. Listed below are some of the best performers. The Mikkelsen's Sunshine series has been a popular choice of growers for several years. 'Nebulus', a salmon-flowered, green foliaged variety, is an excellent selection. 'Pulsar' has rose pink flowers and dark green variegated foliage. 'Radiance' has cherry pink flowers with dark green variegated foliage. For light pink flowers, 'Equinox' is a good selection. It has bronze, non- variegated foliage. A final selection in the Sunshine series is 'Sunglow'. Salmon-orange bicolored flowers and dark green variegated foliage are produced by this compact plant. Another series of New Guineas introduced by Mikkelsen is the Lasting Impressions series. 'Blazon' produces large red flowers atop dark green foliage. 'Cameo' has salmon pink flowers with medium green foliage. In some growing conditions, 'Cameo' foliage may possess a slight variegation. A third series developed by Mikkelsen breeders, though not involved in the field study, also looks promising. The series, called Twice as Nice, has double flowers with 6 different flower color choices. Ecke breeders have developed the Pure Beauty series. 'Aurore' has orange-red flowers with bronze foliage. Occasionally, the foliage is slightly variegated. 'Melissa' produces coral pink flowers atop dark green foliage. 'Thecla' has pink flowers with an eye and dark green foliage. 'Celerio' produces pinkish lilac bicolored flowers on bronze foliaged plants. The foliage may have a slight variegation. In the Paradise series by Ecke, 'Tobago' has light coral flowers with bronze foliage. Ball's Celebration series has two good field performers. 'Candy Pink' is a light pink bi-colored variety with dark green foliage. 'Light Lavender' is a lavender variety with green variegated foliage. Fischer produces two series that were involved in the field trial. In the Danzinger series, three varieties performed well. 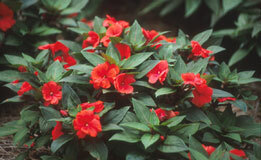 'Danhill' has red flowers with green foliage. 'Dandin' produces lavender pink flowers on dark green foliage. 'Danshir' has coral flowers and dark green foliage. The second series bred by Fischer is the Bull series. One variety, 'Doerte', produces dark lilac pink flowers with green foliage. New Guinea impatiens can be a wonderful addition to your list of flowers this gardening season. Watch for the varieties listed above that have proven themselves in midwestern field trials.